Cool!! That's something different!! I wonder how it wears! I have never seen or heard of these. Mind telling how much you paid for them each? They are very interesting! I am going to buy these just because of how they look. That's cool. I have Fruit Punch and your description is spot on with what I experienced, they aren't bad but I don't know how much I'll use it...I just got it because it's cool. I wonder how the Clarins ones are. Soo Cool, hopefully they will release them in the UK. Too bad the product isn't more compelling, because that is some GREAT packaging. Still, for slightly-tinted scented lip balm, I'm sorry, but Dr Pepper Lipsmackers are unbeatable. UN. BEATABLE. Scent Of Pink, pretty much just clear! Nails By ScarsLikeLace, I paid around $4-$5; I don't remember the exact price offhand, but they weren't more than $5. Collier, Dr. Pepper Lip Smackers for LIFE!! lol these look so RAD! How have I not seen these?! Oh man, I need these! 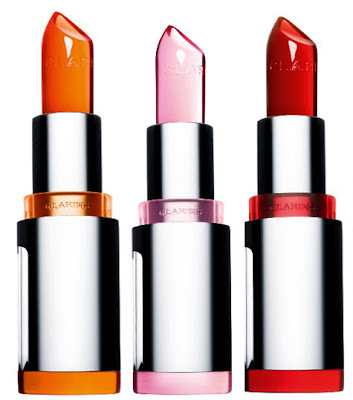 I bought the Clarins ones and I am afraid to use them because they are so pretty. These will make a nice substitute! They look awesome! Unique idea! Very interesting looking--I'll have to remember to look for them b/c I wouldn't mind trying one out. I read this post yesterday then went to Walgreens and they had them for 6-7 bucks, so I didn't get any. Then I headed to Bed Bath and Beyond and they had them for 4-5 bucks, so I got the Pink Lollipop :) They're not bad, but whatever they're made out of is not very durable on the stick, the product gets pushed up against the inside of the tube with the lightest application, so I don't think it will last very long before it breaks off the base. And while the scent is pleasant the taste is terrible, tastes like bitter chemicals. I also noticed by the end of the night the color made me look like a senile granny with hot pink lips, or a 5 year old wearing "play makeup". Still, it's so fun to look at that I'll probably still use it. These are interesting looking. Never seen anything like them. Shame they aren't what you wanted. I want to pick these up just because they look cool! Love the post :) Are these sticky like lip gloss? I love the look of lip gloss but hate hate HATE how my hair always gets stuck on my lips. If these give off a nice shine pay-off I would definitely get one of these. I bought this in pink lollipop, and I like it it's okay. I do love that it doesn't leave too much of a hint of color, I'm a bare lips type of person. I honestly bought it for the packaging.